Doing away with the ordinary in exchange for the extraordinary is what Royal Caribbean does best. With an onboard casino, poolside movie theater, kids' water park, health spa, and solarium, Majesty of the Seas makes for a truly memorable experience. There are late-night pool parties, dance parties, table tennis tournaments, cooking classes, an award-winning kids club, a rock climbing wall, and a sports court. There’s full internet access onboard, and 24-hour room service available. If all that weren’t enough, you’ll be cruising Bahamian waters. Locations range from luxurious Nassau, where dolphins frolic in the sea, to the exclusive island of CocoCay, where the warm waters and soft white sands are complemented by a floating bar and aquapark. Back onboard, sensational live music, comedy, and acrobatic shows entertain passengers late into the night. 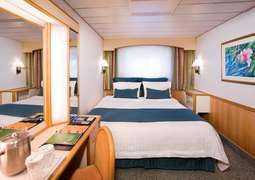 Choose between ocean-view and interior staterooms and extra spacious suites. 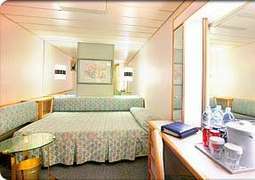 All of Majesty of the Seas' staterooms' have private bathrooms and two twin beds that can convert to a queen-size double. The junior suite includes a sofa bed and balcony, and the grand suite boasts two bedrooms, two bathrooms, a living area, and private balcony. Accessible rooms are available, along with 24-hour room service. Experience an authentic 1950s dining experience, with a selection of burgers and fries at Johnny Rockets, dive into a Sorrento’s pizza, or sample world cuisine at Windjammer Café. 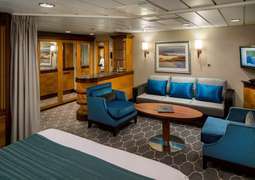 Whereas you’ll find plenty of coffee and baked goods for a quick snack, if its convenience you’re after, you can also dial up room service and dine in the comfort of your stateroom. There are four bars to choose from onboard Majesty of the Seas, meaning you’ll be spoiled for choice when night rolls around. However, during the day, there’s also plenty to keep you occupied. Attend an art auction as you sip champagne or lounge by one of the two swimming pools. Splashaway Bay – the onboard waterpark – will entertain the children, and the kids club, Adventure Ocean, organizes activities for kids aged 3 to 11. There’s also a fitness center, whirlpool, and spa, and you can while away a few hours enjoying the boutiques, art gallery, and lounge. While the dress code on Majesty of the Seas is casual, shorts are not allowed in the dining room. Slacks and shirts are appropriate for men and women in the evening, and there is one formal night, where a tux is advised for men, and a cocktail dress for women.